Worried About Your Dog Fretting When You Go Away? Many dogs fret when their owners go away....and the owners worry that their dog will be sad that they have been left behind. Well, don't fret, you won't have this problem when you leave your best friend with Don't Fret Pet! - a caring dog kennel alternative. Puppies are welcome. We can save you and your pets from the dread of fret-filled holidays.... giving you a blissful, happy holiday free from guilt and regrets. Your dog will be welcomed into the home of a dog lover. 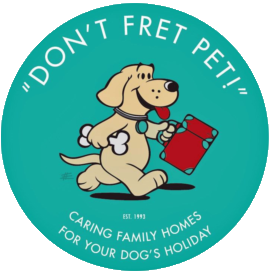 Feel completely relaxed on holiday, knowing that your dog is getting the attention they deserve in the same pet friendly and safe environment as your home. You will meet your dog's minder in advance for total peace of mind. Read what some of our clients have said about their minders. Our dog minders appreciate the importance of treating your pooch like a member of the family and will welcome your dog inside their home. Naturally, because we are a quality service, your dog will be the only one that we book in with your minder at that time. We will match your dog, or puppy, with a dog minder in your local area, leaving you less hassle in that sometimes hectic time before you go away. Our dog minders also try to be as flexible as possible with times for you to drop-off and pick-up which means that sometimes you can leave your best friend for one or two days less than if you used a dog boarding kennel. If you've ever felt a little uneasy dropping the four-legged member of your family at a busy boarding kennel, then consider a different approach to dog minding. Imagine how much more you will enjoy your holiday knowing that your dog is happily being pampered by a caring and loving family. Perhaps you have a number of different pets or just feel more comfortable having your best friend at home. Why not let one of our responsible and caring Minders visit and spend time with them. Visit our pet sitting service page for more information. Since 1993, Don't Fret Pet! has been providing a caring, friendly, professional alternative to dog boarding kennels and delivering highest quality care, born from a love of spoiling pooches.